7 Things That Non-Harry Potter Fans Will Never Understand About "Potterheads"
Now, before all the web trolls start tweeting me to tears, let me clarify that I’m not anti-Harry Potter. I have nothing against the magical chap, or his fiction series, or his films — and I am definitely in support of any story that encourages kids to develop a love of reading. I think J.K. Rowling is a pretty cool lady, and the commencement speech she gave at Harvard was kind of wonderful. So, good feelings all around. With that said, I've simply never read the Harry Potter series in full. I read Harry Potter and the Sorcerer’s Stone , and Harry Potter and the Chamber of Secrets , and I’m almost certain I started the third book in the series… but quite frankly, I arrived at the Harry Potter party kind of late in my childhood and just never got around to finishing all seven. 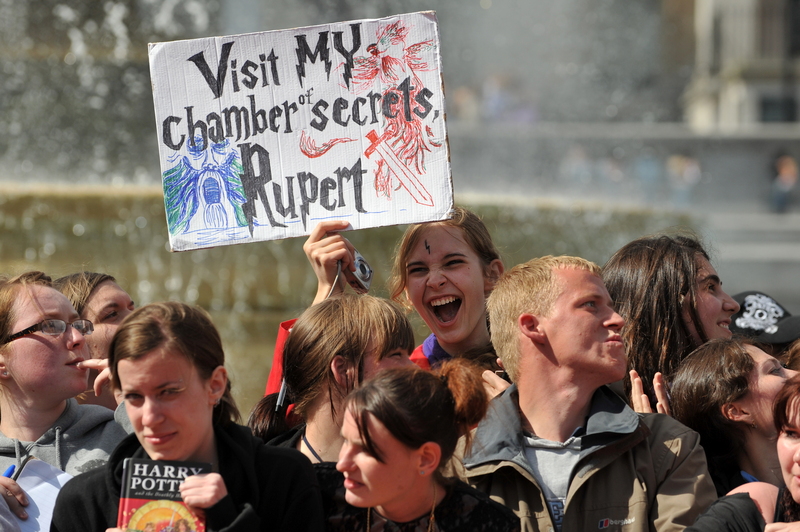 But even if I had, I still don’t know if I’d be totally on board with the craze that is Potterhead fandom. I don’t really understand the unwavering commitment to fictional academic “houses,” the obsession with a seemingly never-ending backstory, or the need to consult Potter-isms before every major life decision. And, honestly, there are only so many memes one can look at before they all start to look the same. I don’t think even The Beatles got this much love, y'all. Here are seven things that non-Harry Potter fans will never understand about Potterheads. Why isn't Harry Potter himself ever anyone's favorite character? All I ever hear about is how great Dumbledore, Hermione, and Ron are. Even the Weasley twins get more love than HP. The series is named after him, after all. What gives? Why was reading Harry Potter supposed to be the defining moment of my childhood? What doesn't make sense to me is that if you’re considered my peer — aka the folks on the older end of the Millennial spectrum — then reading the Harry Potter books wasn’t the defining moment of your childhood, either. We were in college by the time the series was complete. I don’t know when your childhood ended, but mine ended around 1998 when my favorite model of Easy-Bake Oven was discontinued. Why do you keep making Harry Potter references when you know I don’t know what you’re talking about? Horcrux? Alohomora? If I walked around all day casually making obscure references to, say, Chaucer, I wouldn’t have any friends left. Why haven’t you read all of J.K. Rowling’s other books, too? All I ever heard about The Casual Vacancy was: “It’s just not Harry Potter.” No, it’s not: It’s called The Casual Vacancy. The lady was driven to start publishing under a male pseudonym! Is that any way to treat the creator of your beloved Harry? I think not. Why do you assume that non-Potter readers are trying to personally offend you? It’s not like you wrote the books. Why is Hermione considered one of the most badass ladies in YA fiction? Just kidding — I haven’t even read the series and I totally get this one. She’s amazing. But really… why the obsession? Seriously. I really do want to know — and not so I can judge you. I want to be in on the secret too. (Deep inside all bitter non-Potter fans, after all, is the hidden fact that we really just feel super left out.) Why of all the books in all the libraries across the world is Harry Potter the story to trump all stories? What did I miss in the first two books that didn’t ignite the Potter spark? Am I lacking in passion? Commitment? Whimsy? Am I missing the magical gene? SOMEONE EXPLAIN IT TO ME!